Order Stairs and Stair parts online at Tradestairs.com. Axxys2 is the new range of stair balustrading components offering a new solution using a square stair baluster.. Here you can see the axxys squared system in Oakwith Chrome fittings . Link - Order Axxys2 Stair components online. Axxys2 offers an alternative to the current systems when looking for contemporary balustrading. With the new axxys squared range you no longer need unsightly baluster brackets. 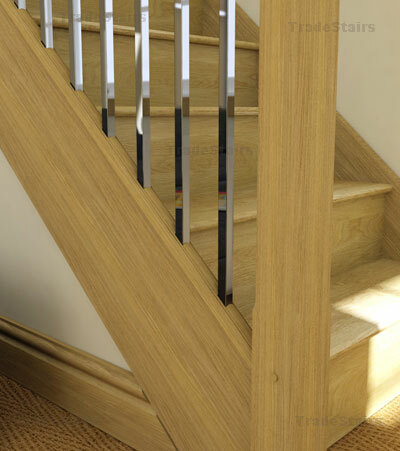 The Square chrome balusters sit in the handrail and baserail grooves lie traditional timber stair spindles. 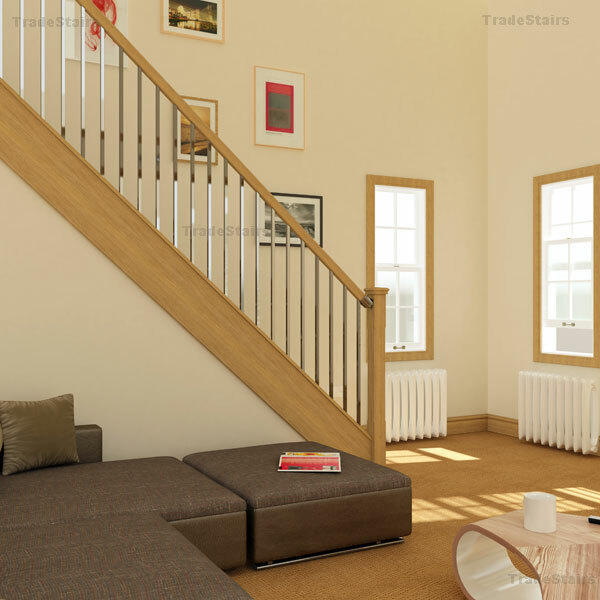 Have a look through the stair layout drawings we have on the websites identify the layout closest to the staircase you require and phoneus with the reference, you can also let us know the style and materials you would like the stairs in. 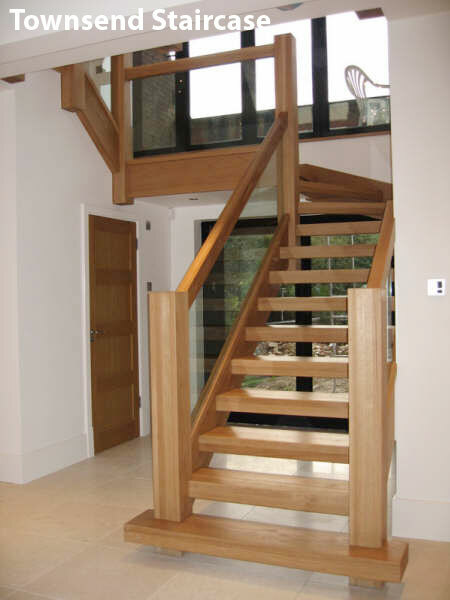 The Townsend Staircase is a bespoke staircase in Oak - The staircase is made up of chunky Oak sections - the balustrade panel is glass. Express Order Service For a small premium we offer a Express order service for staircases, typical delivery on a Express order staircase is 10 working days. Stairparts Aswell as offering complete sets of stairs we also offer stair parts, We offer Stair spindles , newel posts handrails etc all at huge savings off the recommended retail prices. Staircase Regulations We have a selection of notes to help you with the relevent regulations on stairs in the UK. Please note diferent regulations apply to Scotland compared to England and Wales. Fusion Stairs Stairplan are the Leading single outlet for the Fusion stair balustading system from Richard Burbidge, this modern set of balustrading components with Chrome or Brushed Nickel finished fittings has prooved to be a huge hit in 2005 - 2007. Lowest prices for Fusion !! 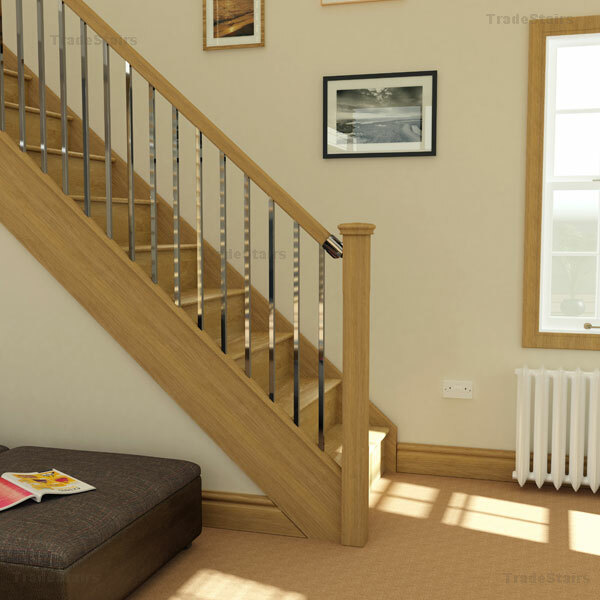 Ordering stairs online Save £££ We do have a facility to order stairs from a selection of standard layouts online there are floor to floor heights available from 2500mm to 2800mm. There are Straight stairs , Single winder stairs and some double winder staircases. Axxys Stairs The Axxys range of stair parts is another contemporary range again offering Chrome and Brushed finish components like the fusion stairs range. We started offering the Axxys in September 2007 and it is now prooving to be a popular choice.